Online reservations at Pietro's Italian Restaurant can only be made directly on their website. 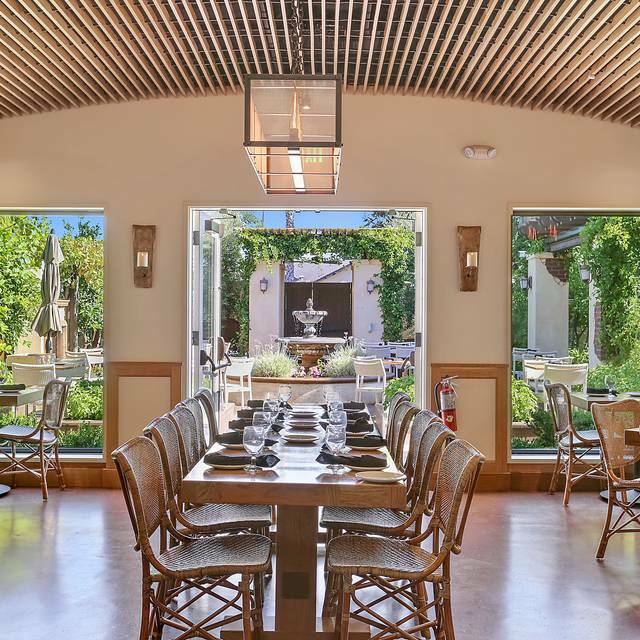 Welcome to Pietro’s of Lodi, a newly renovated, modern Italian restaurant that serves rich flavors and authentic cuisine. 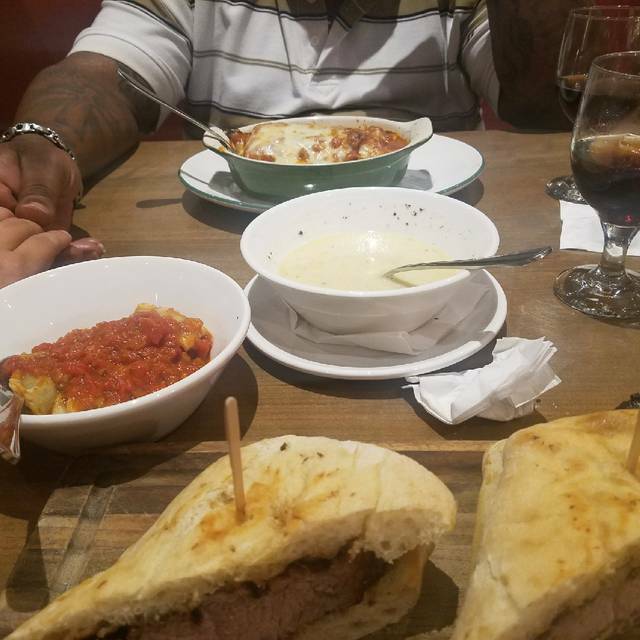 Since 1957 the proud family tradition of serving great food lives on with favorites like hand-tossed wood-fired pizza, homemade ravioli, and authentic minestrone with homemade bread. 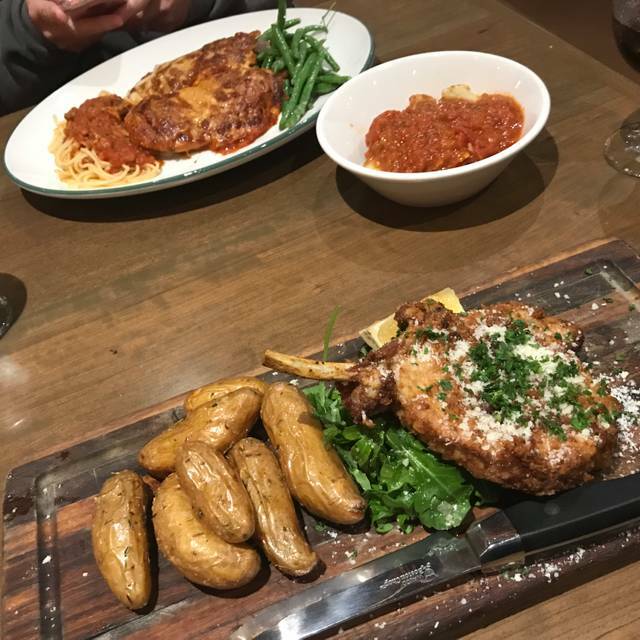 We offer dishes such as Veal Saltimbocca, Cioppino and Eggplant Parmigiana. The menu is also complimented with a Catch of the Day special and our Italian Dinner Party. Our homemade desserts of cannoli, tiramisu and biscotti are made fresh daily. The final authentic touch is our on-site herb and vegetable garden patio where one experiences the true fresh taste from farm to fork. It gives one the feel of a "meal with mama" on Sunday afternoon in Italy! Come and meet the owners Jim and Annette Murdaca personally, as Chef Pietro Murdaca continues the family tradition from the kitchen. Stanza di Vino room - accommodates 22 guests; Un Bel Paese room - accommodates 34 guests, Garden Pation (outside) - accommodates 44 guests. We also offer specific banquet menus to make your dining choices easy and delicious. As always the food was excellent. The wait staff never disappoints. Always friendly and attentive. Our dinner was delicious. We ordered the "specials" for the evening. We started with the zucchini flowers and then enjoyed the risotto with asparagus/prechutto. It was a delicious dinner. Pietro's was highly recommended by the owner of the B&B where we stayed and we were not disappointed. The food was exceptional and the services was very efficient. The mushroom risotto was a hit with several of us and the cioppino also received rave reviews. It's best to make reservations especially for a large party because it's a very popular and busy restaurant. We love it at pietros. The waitstaff is great and the food is superb! Wonderful place to have dinner with friends and family. Pietro’s is a wonderful experience. 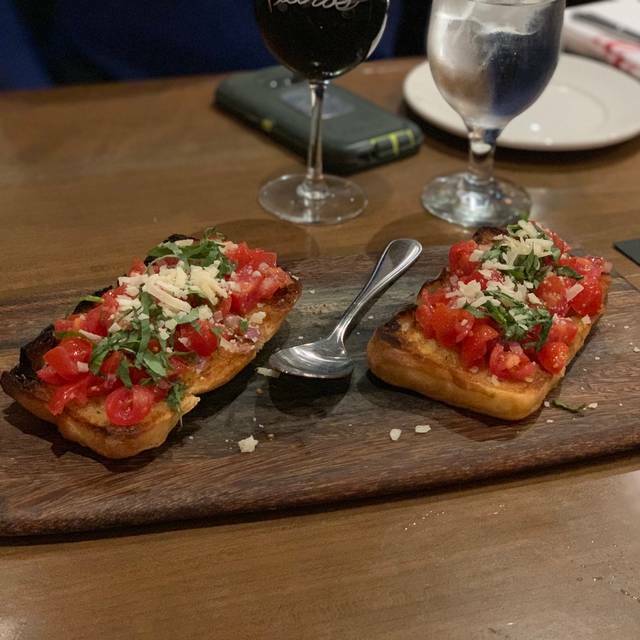 Classic Italian food prepared with care and fresh, local ingredients. 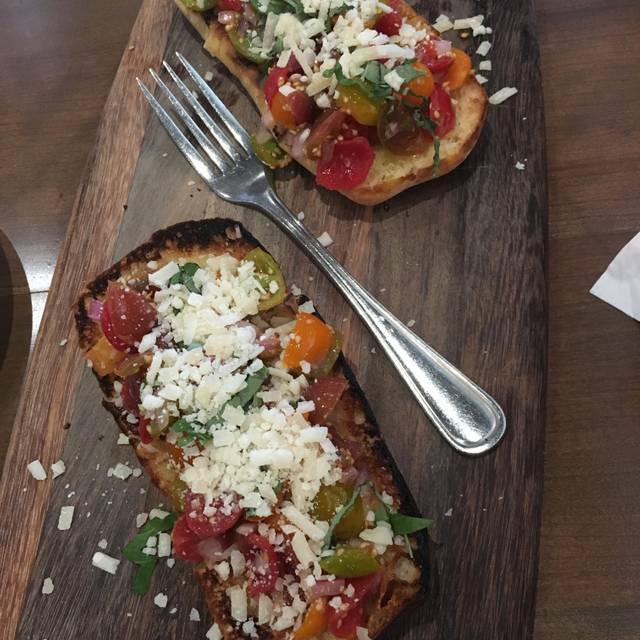 Highly recommend starting with the antipasti appetizer. Delicious assortment of salami, cheeses, and vegetables. Pietro’s staff is one of the hardest working you’ll see in the hospitality industry. Yet they always have a smile on their faces and will always take the time to answer your questions and see you’re taken care of. Always a delicious meal and a great experience. Loved the food, but the noise level was so high it might put us off coming again. Good service but not great. Birthday for my daughter. The Murdaca family has done a great remodel on this place and the food is amazing. We arrived 30 minutes late for our reservation, but still got seated quickly. I loved my ravioli. My friends were quite happy with chicken piccata and asparagus. It was pretty busy, but they did not press us to leave ASAP. The staff was attentive. Great! 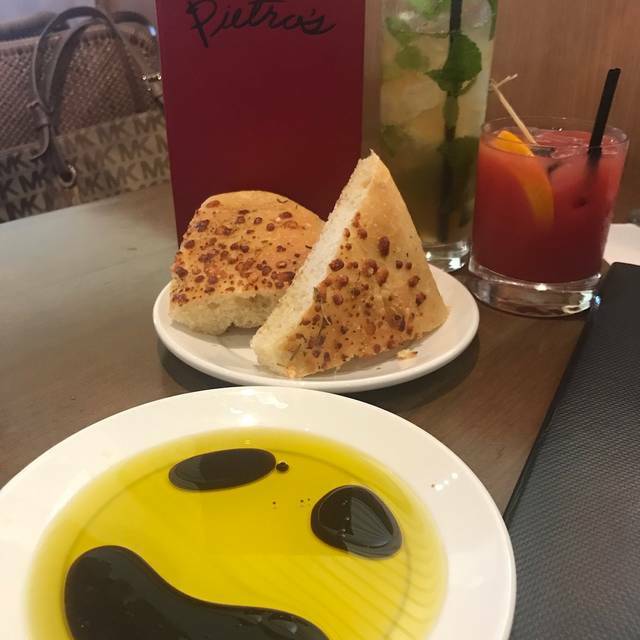 I’ve been to pietros before & really liked it, this time was different. The service was courteous, professional & brisk. I felt like we were being strongly encouraged to order an appetizer, add on a salad & soup, order dessert. I felt rushed, the server asked to clear my daughters plate before she was finished, we were offered to go containers while we were still eating. It was not the relaxed dinner I was anticipating. The was food was fresh but bland, I was disappointed as I was really looking forward to the evening with my mom & daughter. I won’t be rushing back. Pietro's has great food. All the dishes were done well. We had the family style dinner. Only disappointment was we brought one bottle of wine and bought two and they still charged us $20.00 corkage. Most restaurants don't do that. 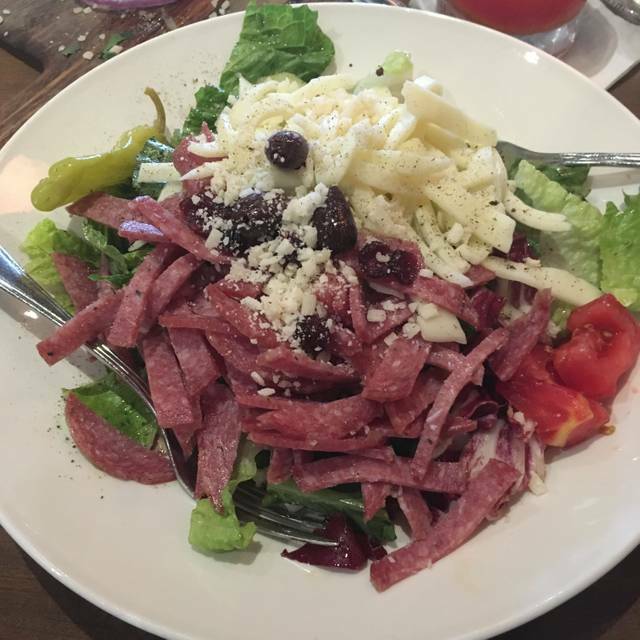 Pietro's has great food, service, and ambiance. I have eaten there several times and we sat outside in the patio this time. The patio area is a great place to eat if it's not too cool or hot. There is a water fountain outside that helps soothe the general conversations going on around you. Pietro's is our very favorite restaurant. Food, service and atmosphere .... excellent! We enjoyed the service, the food was well-prepared and well-presented. The minestrone was exceptional, and my companion was impressed by her funghi pizza. Our only negative thoughts were about the high noise level. My favorite place in town! Great food, service and drinks. And the new patio is beautiful. Excellent food and service. The restaurant has comfortable booths and lots of light. You can see the fresh food being prepared. Would recommend for lunch or dinner. We all had fish. One had the prawns and two of us had the catch of the day, Petrale Sole. It was wonderful. Nice and fresh. Food was excellent!!! We had the dinner for two and it was actually too much food for two people. The service was exceptional and when we arrived we were seated within a couple of minutes. I would recommend this restaurant to anyone who enjoys delicious Italian food. GREAT good, we'll be back! Pietro's continues to be one of the best Italian restaurants I have been to, outside of Italy itself, and I have been to Italy three times. Always good to go to Pietro's. Delicious, fresh food at a reasonable price. Service ws especially prompt. As always great food and great service. Love the atmosphere. The food is always consistent. The atmosphere is inviting. The service was great! Had a great table in the middle of the room. The ones against the partition are a little tight so we were very happy with our table. It was very busy so very lively. Love the outdoor patio, too. Parents were visiting from out of town. This is one of my Dad’s favorite restaurants and every time he’s visiting, we make a point to visit Pietro’s. They never disappoint! Lots of April Fool’s “babies” celebrating birthdays. Everything was just right. 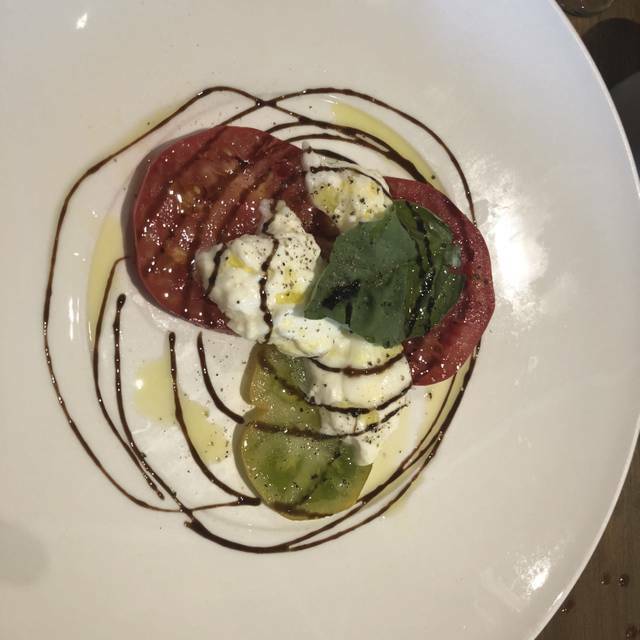 We love going to Pietro’s where the food is consistently delicious. Great food and wonderful service. Calamari and tortellini were delicious. The food was delicious! We sat outside and enjoyed the patio area! Wait staff is excellent! The food is amazing! Love this place! Most meals are very good but avoid the veal lunch as it's wholly over priced at $27 each for maybe one ounce worth of veal divided into three tiny pieces each perhaps two and one half inches long, one inch wide and my father's was actually tough. Very, very disappointed in the veal lunch plate. Just another great dinner and service. Fried chicken was outstanding . We had a great time, the food was amazing and the service was geeat! Party of 4-Great Service! Food was great and nice atmosphere near patio ! Pietro’s is lovely; especially sitting outside on a nice day. The service was very good and the menu has good variety. However they still do the old style of barely cooking your vegetables. Both of ours were beautiful looking string beens so under cooked we couldn’t cut them easily with a knife. Then they tasted raw. Very disappointed. I have already recommended Pietros to several people. I think I liked the old Pietros a little better bc of the ambiance. Seems like younger people are dining there. We always look forward to going there. We were celebrating our 30th wedding anniversary and Jim and his staff were very kind to us. It is nice to know you have a local place that provides that level of quality. 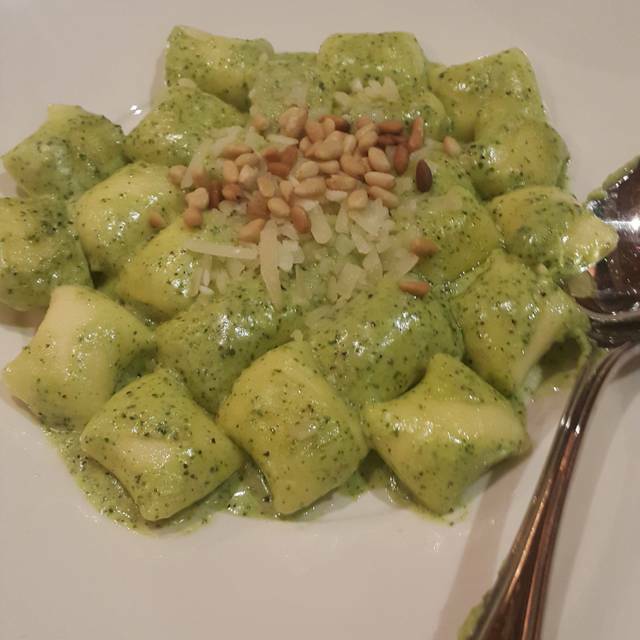 We have enjoyed Pietros restaurant several times now and have not been disappointed. The wait staff is fantastic, the ambiance of the restaurant is great, and the food is very good! We have recommended Pietros to many of our friends and acquaintances here in Del Webb Manteca and will continue to do so.